Clare Woods is a renowned British painter, who established her reputation with large-scale landscapes painted in household gloss and enamel on aluminium. Recently, the artist has moved into figurative painting. The Mead Gallery exhibition presents a new series of raw and powerful paintings, frequently vast in scale, which were inspired by found photographic imagery the artist collects. These images often depict people at their most vulnerable, including in situations of conflict and confinement. 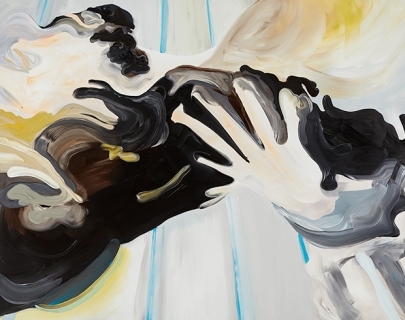 Reinterpreted in oil paint using long, curved brushstrokes and sensuous colour, Clare Woods has created paintings which contain an intrinsic tension between reality and abstraction, beauty and its troubling undercurrent of ever-present danger. Clare Woods’ work is held in many major international collections including the Arts Council England Collection, the Arken Museum of Modern Art in Denmark, and the Albright-Knox Gallery in Buffalo, USA. Recent exhibitions include Pallant House Gallery in Chichester, Oriel Davies Gallery in Wales, National Museum of Wales, Buchmann Gallerie in Berlin, and a permanent public commission for the London 2012 Olympic Park. Please note that on Tue 16 Jan the exhibition will be open to the public from 7pm due to another event. Click here for tickets and more information. The following information is for teachers and home educators. Suitable for EYFS, KS1, KS2, KS3, GCSE and A level students. Arrange a FREE self guided or led visit to this exhibition. Led visits include an opportunity to explore how Clare Woods moves from inspiration to large scale painting and will also provide the opportunity for students to work at scale and on resistant materials in our Creative Space which features wallpaper showing Clare’s studio. 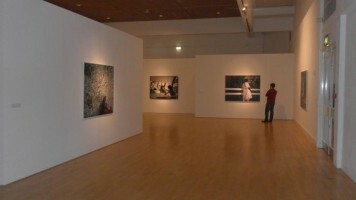 The works in the exhibition include both portraiture and still life pieces. For KS3/4 – the focus will be on choosing subject matter and the lines that demonstrate the form and discarding what you don’t need. Bespoke opportunities are available on request. A visit to the gallery can be combined with either a theatre show or a visit to the sculptures on campus contact us to discuss these options further. To find out more, contact our Creative Learning Coordinator, Lynsey Cullen on l.cullen@warwick.ac.uk.